Users can quickly and easily change the administration year for an assessment while walking through the standard steps to create an assessment within SchoolCity SUITE. The following information details how this will be completed. Users will start by accessing the assessment creation tool within the Assessment Manager. Selecting the type of assessment they would like to create using the Create Assessment button. Upon selecting an assessment type, select the Year drop-down menu on the Assessment Info. Use the standard step-by-step assessment creation tools. 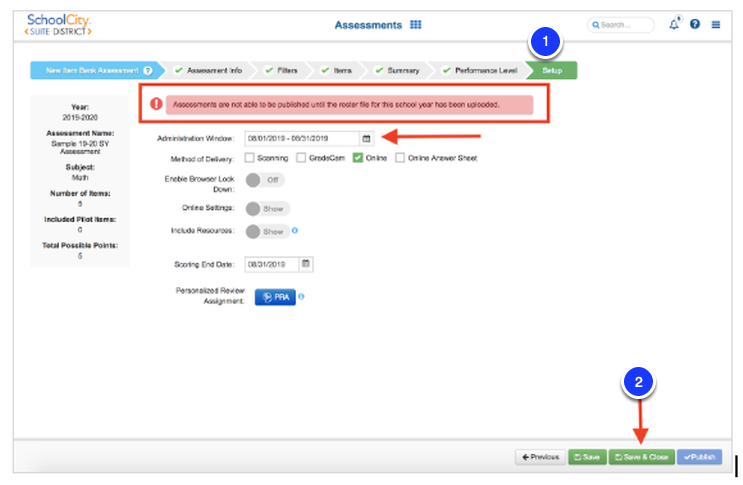 Upon reaching the final Setup step, users will need to ensure that the Assessment Window falls within the school year that they will administer the assessment. Assessments for a future school year cannot be published until the school year roll-over has taken place in SchoolCity SUITE and a roster for the school year has been made available. Select Save & Close when the assessment creation process is complete. In order to access the assessment from within the Assessment Manager, users will select the future school year from the Year selection in the filter bar. A notice on the page will indicate that the assessments are unable to be published since a roster is not available for that school year at this time. Now review your various assessment options with an Overview of Assessment Options!